Built 80% for the street and 20% of the track, Ferrari made the Challenge Stradale a track car that can be used off the track. The 3.6 litre V8 produces 425hp and revs up to 8700RPM. Only 1288 Challenge Stradales were ever made. There are 1315 Ferrari F40’s made, making it more common of a car. Our friends from Engineered Automotive sent us this pristine example (less than 5000km on the odometer) for a full SunTek Ultra PPF wrap and OEM Stradale Stripe installation. Before we began, we gave the Challenge Stradale a very thorough wash and decontamination. Even though the Ferrari arrived in pristine condition, we must make sure the paint surface is 100% dirt, wax, sealant, and oil free. 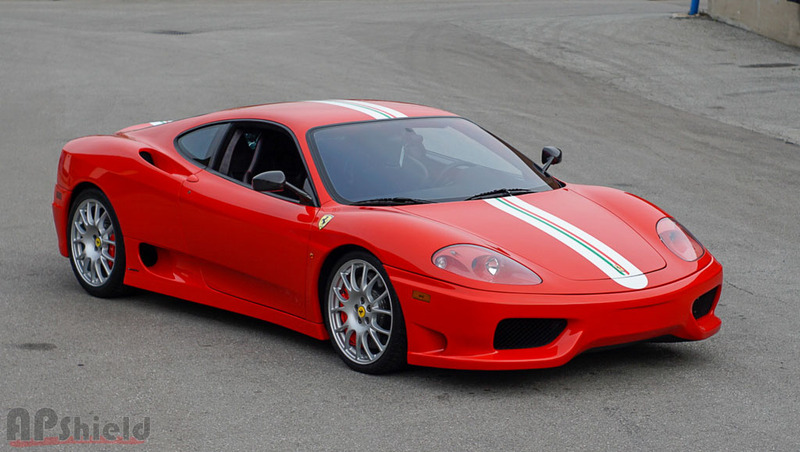 Prior to wrapping the Ferrari in SunTek Ultra PPF, we installed the OEM Stradale Stripes. The owner of the vehicle wanted to keep the stripes protected and as OEM as possible. One of the unique features of the Challenge Stradale is how the front fenders wrap around the whole front of the nose. A common practice with other installers is to install the fenders in 2 or even 3 pieces!!! We hate seams. So we opted to apply the front fenders in 1 complete sheet of PPF, measuring 13 feet by 5 feet!!!!! So just think about this for one second. Have you ever tried to install a screen phone protector, and got a spec of dirt of dust underneath it? That’s probably done on a clean kitchen countertop, and the phone screen is what…. 6 inches by 3-4 inches? Now think about the sheet of PPF we used, its 13 feet by 5 feet. Installed with no dirt, lint, or bubbles. Now that’s experience you can trust! SunTek Ultra Film being applied on both fenders. No seams. Passenger side of the fenders wrapped. Working on our way to the drivers side fender. Fender edges around the headlights, along the bumper, along the inside of the front bonnet, and fenders will be trimmed and wrapped around. We have a top of the line plotter and most current, up-to-date software when it comes to machine cutting PPF for kit installations. On many of the modern vehicles, 2010 and up, the kits have an excellent accuracy of a cut (1/16th of an inch). However, some vehicles are not included on the software, or the cutout is good, but not perfect. This is where our experience comes in. We opted to bulk install the full vehicle, as we know we can give it a 100% perfect wrap, with no seams. The front bumper is a complex curvy shape, but we managed to wrap the full bumper perfectly with no seams. The rear bumper offers its own unique challenges, but with patience and a little skill, we applied it flawlessly. The rest of the vehicle body was wrapped in SunTek Ultra PPF, including the doors, rockers, engine cover and roof/rear fenders. The finished result ends in a perfect wrap, that will give the Challenge Stradale the protection it needs for its fragile paint. Now the owner can feel a little more comfortable to put a few KM on the car if they choose.